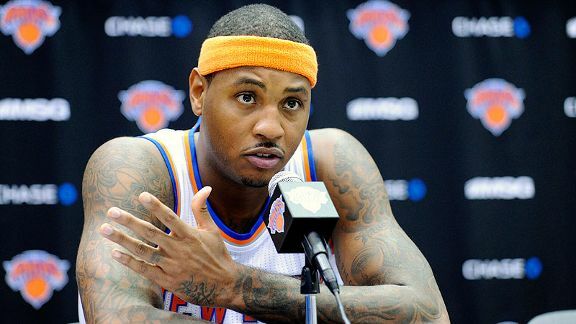 On most nights, Carmelo Anthony doesn’t sound like a man who’s going to leave the New York Knicks. After watching the franchise nab Phil Jackson, it seems even less likely. He’s waxed nothing but support and optimism for the Zen Master. The Knicks’ season-long seven-game winning streak even has him smiling in spurts again. Anthony has free-agent options, and two have risen above everything else: Chicago and Houston, sources with direct knowledge of his plans told Yahoo Sports. The Bulls have an easier path to clear the necessary salary-cap space to sign Anthony, but the Rockets believe they can shed the contracts necessary to offer a third near-max deals alongside Dwight Howard and James Harden, league sources said. The Chicago Bulls have long been considered potential suitors for Anthony, provided they, you know, dump half their team (I’m only half-kidding). The Houston Rockets, meanwhile, are somewhat new to the always churning rumor mill. General manager Daryl Morey is known for making, surprise headline-grabbing acquisitions, but this may be out there even for him. The Rockets don’t have cap space this summer. For them to even think about signing Anthony, they have to dump Jeremy Lin and Omer Asik and the balloon payments they’re do next year, and hope the Knicks superstar is willing to take a pay cut on top of the money he would already be leaving on the table by spurning New York. Brokering a sign-and-trade is always possible, but then again, it isn’t. There’s little chance the Knicks are interested in Asik or Lin and they would likely demand Chandler Parsons, who the Rockets are beyond long shots to give up. Could you imagine the firestorm of rumors that would ensue next season if Anthony decides to simply opt in for 2014-15 and become a free agent in summer 2015? Speculation would be even worse than this. Here’s the thing: No one knows what Anthony is going to do, not even Anthony himself. There’s a reason free agency isn’t staged during the season. Players need time, even if only a little, to reflect and listen to different sales pitches. If you ask me, I think Anthony stays. If he wasn’t going to before, Jackson’s hire is something that should keep him in New York. But again, that’s based off Anthony’s recent comments and conventional and financial wisdom. No matter what I, you or anyone else thinks, believes or claims they know, Anthony’s free-agent decision won’t come until, you know, free agency. In other words, brace yourselves for another turbulent couple of months. Dan Favale is a firm believer in the three-pointer as well as the notion that defense doesn’t always win championships. His musings can be found at Bleacherreport.com in addition to TheHoopDoctors.com.